Crossover’s innovative school calendar provides time for experiential learning and leadership development in addition to regular academic coursework. The school year begins with four weeks of “A-Term” (August Term), where new students are oriented to the routines and culture of Crossover Prep while participating in partial-day coursework in math and English (7th-9th grade) or elective subjects (10th-12th grade). 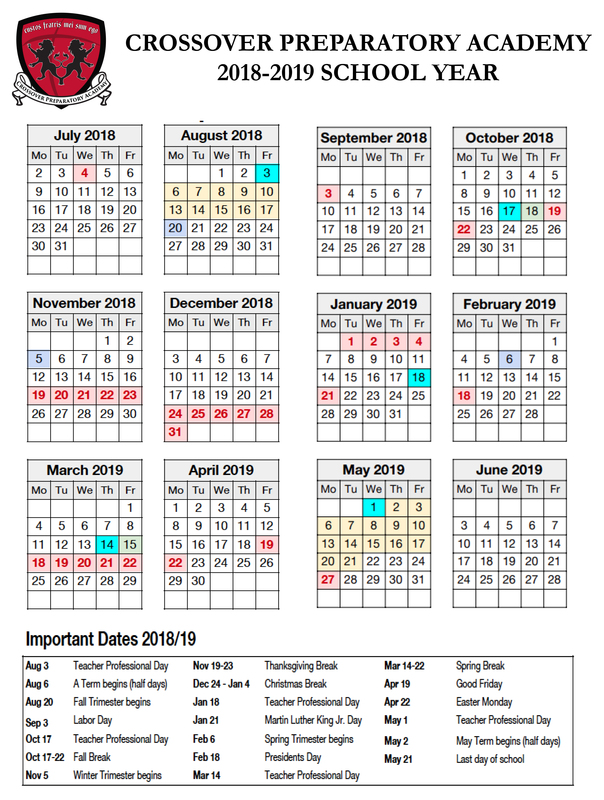 The fall, winter, and spring trimesters include nine weeks of rigorous academic study, along with holidays and scheduled breaks (fall break, Christmas break, and spring break). The year concludes with May term, where students pick a single experiential learning course to study for four weeks. During May term, students could do anything from completing a business internship or volunteering with a community service organization to producing and performing a play to researching and filming a documentary.